"My mother, Marilyn Lucas Berman, was one ridiculously stylish Vuitton-toting, platform-wearing, ponytailed style icon not just in the 70's but later (oh the pictures of the Versace dress she wore for her 40th in the 80's, spiky short hair and crimson lipstick to boot) and in fact throughout her life, schooled as she was, in fashion, by her own very stylish mother, Ida (whose actual Vuitton bags I have inherited and which I wear to my Hollywood meetings with pride). When my mom died, 2 years ago, she owned 7 pairs of leather pants in assorted colors, one for each day of the week. What 65 year old woman needs 7 pairs of leather pants? My mama. Marilyn also took painstakingly good care of her things, so items bought in the 70's were in pristine condition. Triple Libra. Size 6. Flawless. 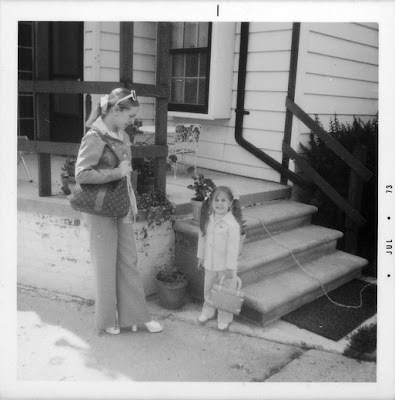 This is my mom in 1973, with me. she is indeed my style icon. and since her death, i've taken to wearing her actual sunglasses (filled with my prescription) and handbags."